Look Back in Mild Bewilderment: Are we all Wigan in disguise ? Are we all Wigan in disguise ? The missus in her infinite wisdom bought me the excellent Soccernomics Simon Kuper and Stefan Szymanski and I have spent much of my Christmas Break with my nose buried in it. 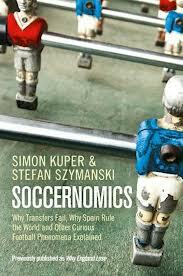 In essence it is an economics book about football written in a style that makes it accessible to the non-economist. At one level the book is a wonderful statement of the bleeding obvious that the resources that a club, league or nation can draw on determines its relative success on the pitch. However the authors debunk one or two footballing myths along the way and critically identify wages as being the key determinate of success at club level rather than transfer fees. It is a rule that holds true across leagues and over time. Prompted by this and a tweet from a fellow Baggie " A club without ambition is not a good thing. Don't want to be a Wigan." I have penned a few thoughts on why Albion fans and indeed fans of most Premier League clubs should not sneer at Wigan. Whilst that is the general rule over the course of a season clubs with relatively large wage bills will under perform and those with relatively modest ones over perform. Wigan's limpet like grip on the Premier League is testimony to this, whereas clubs with much greater resources Newcastle and Southampton for instance have been relegated to the Championship. Actually Wigan's continued Premier survival is one of the greater mystery's of the Premier League era even allowing for the fact Dave Whelan has bankrolled the club for a number of years. Within the Premier League there is a clear hierarchy with the contenders for the Champions League spots being able to have wage bills in excess of £90m in efffect form an elite cadre that is virtually impossible to break into over the course of a season. Unless a club is in the elite bracket then it is pretty much in the same boat as Wigan with their first target being survival. The above table from the 2010/2011 which is the last season I can find a full set of financial results for demonstrates the point there is a clear gap between the top 6 and the rest. The gap between the median and upper quartile is £43m but the gap between the lower quartile and the median is £10m. In footballing terms a £10m wage gap can be closed by a combination of smart management and good fortune a £43m gap probably cannot. It is not entirely surprising that the bulk of the division's prime objective is survival when few can pay sufficient wages to guarantee their future participation in the richest league in the world. If West Ham can get relegated with a wage bill £55m then so can every other club, although it would probably take a special level of ineptitude to get a club with a £100m wage bill relegated, Newcastle managed it but they are the exception rather than the rule. Some might say survival is Wigan's only aim but other clubs such as Newcastle and Everton can have realistically loftier aspirations such as Europa League qualification or a cup run and maybe in an exceptional year achieve the holy grail of 4th spot. However over the course of a season the extra resources that the likes of Arsenal and Spurs have eventually tell and generally this is reflected by the fact that since the Premier League had four champions league places only 8 clubs have qualified Man Untied, Arsenal, Chelsea Newcastle, Liverpool,Man City, Spurs and Everton. Moreover Arsenal and Man United have qualified every year and Chelsea all but one. Earlier in the decade Liverpool and Newcastle were frequent qualifiers the latter has long since dropped back into the pack and Liverpool have been usurped by Man City and it remains to be seen if they can get back in amongst the elite. The thing that highlights the difference between the elite and the rest is the Europa League qualification for which is the pinnacle of most clubs ambitions. The extra burden placed on successful mid table clubs e.g. Bolton, Newcastle and Stoke often sees their league form diminish to the point they end up in a relegation battle. Here is the key difference between the rest and the elite. Whilst the elites second string is capable of picking up results against most the rest of the division's first elevens the mid-tables club's 2nd choices are not. Europa league football and the demands it places on mid table squads highlights this like nothing else. It is no coincidence that the team from outside the elite that sustains a challenge for a place in the top 4 is one that does not have Europa League football to contend with Everton this year and Newcastle last year. By Premier League standards they are minnows but because of the relatively even way the TV revenues are distributed by the Premier League they are not so out of touch with 75% of the division as to make it impossible for the club to compete. Critically Wigan might be the poorest members of the club but the Premier League is a very rich club and that is what matters because it allows Wigan to pay relative attractive wages in comparison to the vast majority of clubs both home and abroad. For instance Wigan's income is greater than all but 5 or 6 teams in both France and Spain and the only Dutch team to have more resources than them is Ajax. Domestically the gulf can be demonstrated by the difference between Wigan a club who is often mocked for its poor attendances and the Championship powerhouse that is Leeds United. In terms of money (which is pretty much all that matters in the recruitment and retention of players) Wigan absolutely dwarf Leeds because of the TV rights. If Wigan did not sell a single ticket, pie, programme or have any commercial income they would still be better off than Leeds who are by far the richest club in the Championship if one excludes clubs that are enjoying the benefit of premier league parachute payments. Provided Wigan do not get kicked out of the Premier League club they are about to get a lot bigger because the next round of TV rights could see Wigan's turnover jump to £70m which would be roughly double that of any Championship club bigger than Ajax and even more French and Spanish teams. "There are a lot of players at this club who earn far too much money for what they are; far, far, far too much money for their ability and what they give to the club." When Redknapp came out with that gem in reference to the players he inherited at QPR there were plenty of wry smiles from fans up and down the land and some names like John Utaka sprung to mind. However 'Arry makes a valid point (probably almost entirely by accident) given that the Elite clubs in the Premier League and elsewhere in Europe cream off the best talent, and by definition the rest are left with average to good players. The players that might be one of the top 4 or 5 players in their position outside the elite tend to gravitate towards the top clubs, for instance it is debatable as to how long Everton can retain the services of Mario Fellani and Leighton Baines before one of the elite lures them away. Therefore when most clubs are recruiting there is a ceiling to the quality they can hire and in point of fact the difference in ability between one average right back and another is pretty marginal, however there is no ceiling to the wages that a club might be persuaded to part with for an average to good player. For a team like Albion operating in the mid-table mix we have very little to fear provided that we remain one of the smarter operators and our competitiors are to varying degrees badly run. However over the longer term we will struggle to dent the bigger teams for parts of seasons or even for whole seasons we might run ahead of our wage bill but sooner or latter the wage bill will find us out but the same could be said for pretty much every other team in the division.